You may have noticed a few changes to our website recently. We know that things may have moved around a bit. And as with everything, change can be a bit difficult. So, to help you along you journey to completing an order we thought we would take some time and highlight a few changes, and show just how the ordering process works. Okay, you have found that perfect product, maybe it is a16 oz. stadium cup. You may have used our search feature or maybe decided to look through all of the newly redesigned product pages, but you finally found the perfect promotional product that suits your needs. So, you say to yourself, "What now?" At this point, you have two options: Customize or Get a Quote. The “Get a Quote” tab is a way for you to be sure this product is right for you. If you are working with a limited budget or a quickly approaching deadline, use the "Get a Quote" option for a to see if this product is suitable for your event or simply give the sales team a call. Our talented team is more than happy to work with tight budgets and even tighter deadlines. If you are not worried with production time, choose the second option, "Customize”. 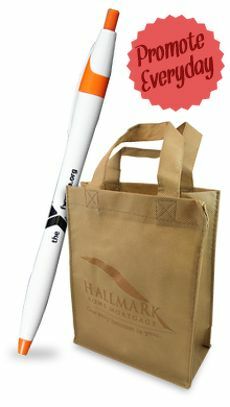 This options puts you in the driver's seat customizing your promotional product. You've chosen the perfect product. "What's next," you ask. Begin by selecting the desired color of the product. All of the colors the product comes in are shown in the boxes. Simply box of color you would like. Next, chose the imprint color. Please remember the color may be slightly different than the color that appears on your screen. 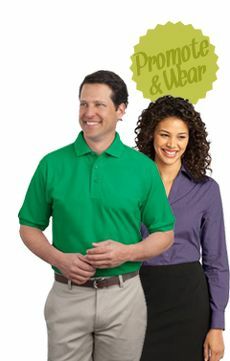 If an exact color match is necessary, give our promo team a call, they are always happy to help. 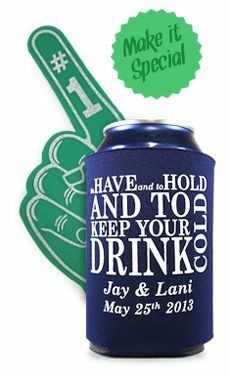 1 Color Imprint on 2 Sides - This option will print your artwork in one color, on both the front and back of the koozie, like this. 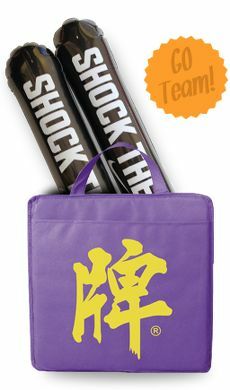 2 Color Imprint on 2 Sides - Your artwork will be printed with two colors, on both the front and back with this option. 3 Day Production, 1 Color Imprint on 2 Sides - If time is not on your side, select this option for rush production. Just remember this does not include the time it takes to ship the order directly to your location. Blank Unsewn - Feeling crafty? These can holders will be sent flat with no imprint. 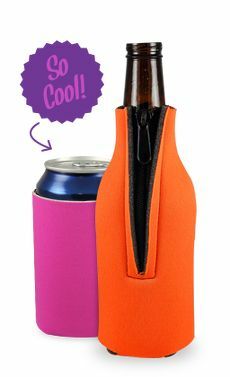 Blank Sewn - If you choose this option, you will only get to select the color of your koozie. It will be shipped to without an imprint. By changing the imprint option, the pricing to the right will adjust depending on your selection. Next, choose the quantity. You can use the slider tool, or type in the quantity you wish to order. The pricing to the right will automatically update giving you the best price on our product. After you've entered a quantity, type in the zip code in which the order will be shipped to. Your total cost including shipping and tax (if applicable) will be calculated for you. After you've selected the quantity and product colors, select the red "select artwork options" button. Have Us Create Your Artwork - Select this option if you have an idea of what you would like your artwork to look like, but would like some assistance creating it. Upload Your Artwork - Select this option if you have your own artwork and will upload it at the time of your order is placed. Upload Your Artwork Later - Select this option if you will be submitting artwork, but will upload it after your order is placed. None - Select this option if you wish to order blank products. If you have any comments about your artwork, enter them in the space provided. To continue, select the "select delivery options". All that's left is to finish up the order. First we need to know when you need your order. If you are working with a tight deadline, this is especially important. Next, chose the shipping type - what type of address are we shipping to? Will we be shipping to your business (commercial), or shipping directly to your home (residential). Lastly, review your order, to ensure everything is correct. If everything looks good, select the "add to cart" button to proceed to check out. Once you are ready to checkout, select "checkout now", you can either check out with an account or check out as a guest. Next, input your your billing and shipping information. After your order is placed, we get busy creating a virtual proof of your order to ensure your products turn out exactly how you expect. Once the proof is approved, your order is placed and we go to work making your vision a reality. Its just that simple! For more info and to see all the wonderful products we have to offer click here!